Why you should befriend locals on your travels. In January 2016, my husband and I managed to take a break from our office jobs in London, and embarked on a half-year trip around the world. It was a dream we’ve both had for years, but never had the chance to realise. We took off with some rough directions in mind, but with no planned itinerary or booked flights. We wanted to achieve just one goal: To experience a different journey from the usual travel checklist, where you rush through the ‘must sees’. We wanted to see real faces in the countries we travelled to; we wanted to live the experience, see beneath the surface, visit the special places that are not normally a part of a tourist’s itinerary, and try to understand and learn from people along the way. Our trip came to its conclusion a few weeks ago, and we feel richer than ever before. We met fantastic individuals around the world, spoke to them about their lives, and gained a much better understanding of the world. We were rewarded with beautiful sights rarely seen by tourists, and learnt lessons from many inspiring individuals who want to make this world a better place. Now we want to share some of the lessons we’ve learnt, to inspire you to embark on a similarly life-changing journey. When I see bad things happening in the world I feel sad, but also too small to make a change. This is probably a convenient reaction. Some of the individuals we’ve met on our trip have made me question if any of us are really too small to make a difference. There are people out there just as small as we are – and possibly with even fewer resources – who take on leadership roles and make a real contribution to their society despite the difficulties they face. By talking to them, we were inspired to take action in our own lives, and gained a much richer perspective of their country’s culture than we would have gotten from a guidebook. Rosa María is a determined, larger-than-life environmentalist who owns and works in the Serere National Park in Bolivia. She – and the back-then newly created Madidi National Park – were featured in National Geographic in 2000, after she successfully campaigned for the park’s creation by the government (and against a mega-dam which would have flooded half the park). She has since worked with the local indigenous community to help its members develop the skills they need to be able to benefit from the tourist potential of the area, such as speaking English or cooking to Western tastes. Rosa María owns a 6000-hectare land just outside the Madidi National Park, where she restored the original environment despite constant trespassing from poachers and loggers. The reserve now provides living space for more unique wildlife than in the National Park itself. Since 2004 she has been running the Serere Eco-Reserve, giving tours for a strictly limited number of tourists and using all profits to maintain the reserve and support its conservation work. It was truly fascinating to meet such a strong-willed, passionate person, and to see how much she’s accomplished against all odds, through sheer perseverance. In the jungle we played with tapirs and monkeys and witnessed the beauty of untouched nature. Experiencing the real jungle – and the struggle of those who try to protect it against individual and political interests – has changed the way we look at environmental issues forever. Anita is another example of a fantastic individual proudly supporting her local community and maintaining its traditions. We spent a day with her in San Pedro La Laguna, Guatemala. It was sheer coincidence that we met Anita: We love attending cooking courses on our holidays and when searching for such an experience, I found some positive reviews from fellow travellers about her recently-launched private cooking experience, the Lake Atitlan Guatemala Cooking Class. Like most people around Lake Atitlan, she is of Mayan descent, and grew up in the village selling fruits. She developed her English to an excellent level by talking to travelers visiting the area. Now she’s my age, almost 30 and – having recognised the many difficulties local weaving women face in making a living from their work – she has created a cooperative among the local community’s women to sell their wonderful Guatemalan handicrafts together. When we visited her in her office, she also explained and demonstrated to us the traditional Mayan colouring and weaving techniques that have been an essential part of her culture. As a fantastic cook with great social skills, Anita has recently launched a business (without any prior-related education) to offer a traditional cooking course to visitors at her home overlooking the lake.With her school she aims to create a special link between visitors and locals. It was the most authentic cooking experience we’ve ever had. After visiting the local market for ingredients – where she’s widely known for regularly bringing foreign travellers – we made a delicious authentic menu at her modest house: chiles rellenos (stuffed bell peppers with vegetable and minced meat) and tamales with local herbs. This was a fantastic opportunity to talk to her about the everyday life of the people living around the lake. She was eager to share her knowledge with us about her ancestors, the Mayans, who have been living in the area for thousands of years. It was fascinating to meet a young, entrepreneurial individual with so much passion to maximise her potential, in order to support others and preserve her culture. After South America we continued our trip in Asia, with Vietnam as one of our destinations. The Mekong Delta was an area both of us had been looking forward to, due to its authenticity and beauty. We were lucky to find Ms Ha, a Vietnamese lady living along the Mekong delta in Can Tho, who helped us gain an unforgettable experience by the river. She used to be a boat-riding guide who took visitors to the floating markets at dawn, and learnt to speak English from tourists, although she never learnt to write or read the language. Due to her persistently high quality of work and dedication, she has grown out of her first role and opened a thriving guesthouse. She now runs private tours to the floating markets and to the villages around Can Tho, which gives employment to many of the best boat drivers she has known, and some of her relatives, whom she has trained to become excellent guides. This has allowed her to help several families who live in very poor conditions. As her job allows her more flexibility, she spends most of her time looking after the children from her family, taking the opportunity to teach them all she knows about business, savings and English, so that the next generation will start with a better base. 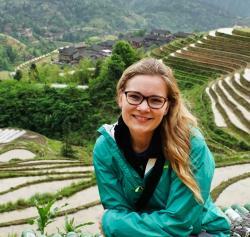 She occasionally runs the tours herself, and we were lucky to join two of these; it was probably one of the best ways to see the real village life on the river and to learn about Vietnamese traditions and people than we could have ever imagined. She’s one of the most energetic and inspiring people we’ve met, who’s showed us the impact a single individual can make on so many others for a better future, without financial support but with a warm heart and by leveraging all she can offer. These ladies from our journey are only a few examples of the people you could get to know if you travel with curiosity, and take the path less travelled to reveal its treasures. Open your mind to people and experiences on your travels, and learn from what you see; there’s so much value that you would otherwise miss.